Steeped in history, this beautiful former vicarage has been a secluded, semi-rural haven for Crawford and Melanie Pollock for the past five years. The imposing five-bedroomed house was built in 1872 and offers family accommodation of grand proportions, set back from a private lane behind St John’s Church, on the outskirts of Killingworth village. “It’s an imposing property and the beautiful front of the house with its large gated entrance was something that took us entirely by surprise,” said Mr Pollock. “Internally, it’s got a fantastic layout, with a beautiful staircase and large hallway. The high ceilings give it a sense of proportion and it’s a very attractive house in that respect. “The master bedroom is a very big room with an en suite which is exceedingly large. Key features of the property include sash windows and shutters, ceiling roses, cornicing, fireplaces and period-style radiators. – a large study, an elegant drawing room and a beautiful dining room, all featuring period fireplaces and lovely garden views. There is also a family room with an open fire and door leading out onto a garden terrace, a kitchen with beamed and spotlighted ceiling and walk-in pantry, a family room which opens out onto a garden terrace, playroom, study, a toilet under the stairs, and a utility and laundry room. To the first floor are five double bedrooms, including a very substantial master with an en suite, a guest bedroom also with en suite, one bedroom has a wash basin, and there is a family bathroom with Jacuzzi bath, double shower and drying area. 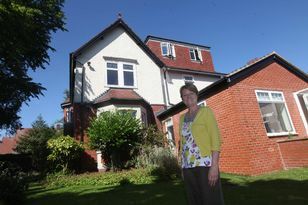 “There’s a lot of history to the house,” said Mr Pollock, a managing director. “It used to belong to the church. Since we moved there we have made quite extensive improvements to it. We have completely renovated and restrung all of the sash windows so they are all in working order, replastered various rooms, redecorated large parts of the house and installed a new boiler and radiators. “We didn’t want a house in town, or that was completely rural. We found that the property is within very easy reach of the town and coast because the road connections are extremely good, and it’s a very generously proportioned house, set in a good sized plot and it’s surprisingly secluded. There is also a stable block which has a single garage, workshop and store areas, and a second single garage and a boiler house. Mr Pollock, 50, his wife Melanie, 45, and their daughter Izzy, four, are relocating due to work commitments. He added: “It’s within an easy walking distance to the shops at Killingworth and a minute’s walk to the middle of the village where there are two pubs. The area has a nice, small village feel to it and while you are on the edge of the greater Newcastle area, it’s surprisingly quiet. It’s a very nice, peaceful setting and a friendly place with a good community feel to it. The Old Vicarage, in Killingworth Village, Newcastle, is for sale at £740,000, through Sanderson Young Rare, tel: 0191 223 3500.